Another perennial favorite, especially when the asparagus are at their best which is pretty much now. I like my asparagus about #2 pencil thin, they could be thicker, but for me that’s ideal. Once again another recipe that I have no idea where is started, but it did start when I was a vegetarian – All those years ago. But it does stand the test of time and come April/May I just have to make it. I think the non-vegetarians will like this – I have proof. You can make it other times of the year if the asparagus look right to you. It’s stupidly simple and no – I don’t have any real measurements anymore. I guess that’s what happens when you make a recipe so often that it becomes a bit of a thing that you like that much. You don’t have to think, you just put the pieces parts together and it works. I especially like that you cook the asparagus and pasta in the same water. There are only two pots (or pans as it were) to do this and a good bit of butter and Parmesan are involved – two of my favorite things. So take a deep breath, like I said it’s simple, but don’t get too hung up on the particulars – taste and adjust – I still do that. I think that’s a pretty good cooking rule to live by. So heat the olive oil and start sautéing the red onion. At the same time, heat a big pot of very salted (like the ocean) water. Drop the asparagus into the salted water (did we get that salted is a key thing here?) and let them return to the surface and be bright green and crisp-tender. Remove with a spider or slotted spoon and let cool. You could do an ice bath, but I never have. Meanwhile, after the onions are soft and the pan is a little on the dry side, you can hit them with a splash of white wine or if you don’t have that, or are not inclined, just add about half a cup of orange juice (real stuff please). Add the pasta to the still bubbling asparagus water and cook till al dente. 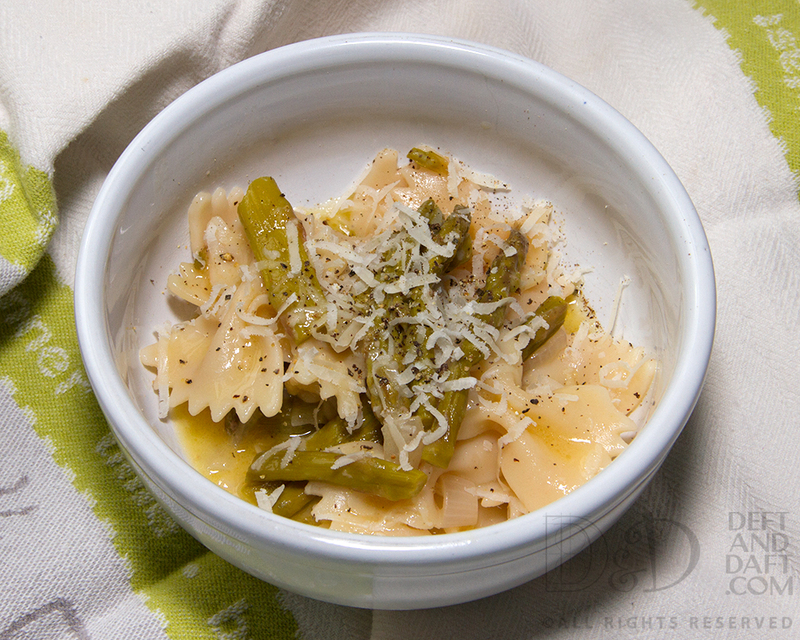 When the oj/wine has reduced a bit, add the asparagus and then the pasta when it is ready. Add another splash of oj and then add about 3 Tbs unsalted butter to make a great sauce. And then – taste and adjust. Does it need more butter, more oj, a little more time to sort of meld together as a dish. I like the sauce to thicken a bit here and if you want to add some pasta water with its starch, but not too much – thickening is the goal. You can add Parmesan now – which I do – and then serve it with more for topping. Sorry there is never too much Parmesan in a pasta dish if you ask me.